Classic studies of political attitudes and behavior have been dominated by approaches that emphasize the role of macro-social factors such as class, religion, and territory (Lazarsfeld, Berelson, and Gaudet, 1944; Berelson, Lazarsfeld, and McPhee, 1954; Campbell et al., 1954; Lipset and Rokkan, 1967). Yet, the decline of traditional cleavage structures and their ability to shape the political competition (Franklin, Mackie, and Valen, 1992) has rendered sociological interpretations of the relationship between the parties and their voters increasingly problematic. 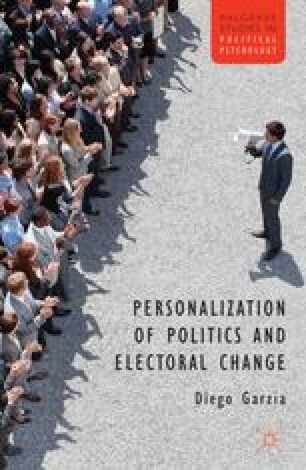 Social modernization and technological innovations, in particular, have led to new forms of interest representation and political communication that affected to a substantial extent the role of parties in the democratic process, thus altering their relationship with citizens.